Los precios de los productos y la disponibilidad son correctos a fecha 2019-04-17 15:30:31 BST, pero pueden cambiar. La información de disponibilidad y el precio correctos serán los que se mostrarán en http://www.amazon.es/ cuando finalice la compra. Consigue de forma segura, rápida y al mejor precio el fantástico Hasbro - Videojuego para niños [importado de Inglaterra] de Hasbro. 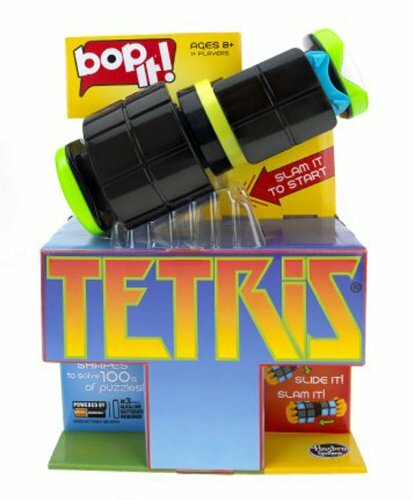 Take Tetris in your hands as this classic game goes from 2D to 3D with this fantastic Bop It game. Slam to start then twist the game to line up and fit together the shapes from the iconic video game. Light and sound effects will help guide you on your mission! Choose from two gameplay modes: in Marathon mode you must tackle the game on your own to see how high you can score. in Pass It mode you can challenge as many of your friends as you want to see who can stand the heat! This game is great for players aged eight and up. It comes with 3 AA demo batteries, but these may not last long.